It's so hot in our part of the world that it's hard to get completely into the deer mode 100 percent of the time. I know I need to start shooting my bow. But when you get home and it's 100 degrees plus in the shade and the humidity level is something akin to a sauna, even the prospect of sticking a foam deer for a little while is a little oppressive. Because of that I've spent the last few weeks not shooting, but remembering the good old days. Like when I was in college and someone (I have no direct knowledge of who and if I did, I wouldn't say) drew a target on the bathroom door at the end of the hall of my dormitory. Word would go out, with warning etc., and we would practice our archery skills down the dorm hallway. Not the wisest thing I ever did, even though my college buddies and I laugh about it often, even after we had to pitch in and buy a new door. The only raw thing about that was after we coughed up the cash, the door never got replaced. Ten years after I graduated, that honeycombed door with holes all over was still hung at the end of that hall. Back in those days, I shot a Bear Whitetail Hunter. It had brackets for the cams and my sights were rudimentary. I taped a couple of matches on the riser so I could gauge up and down or left and right. Even with them, I was basically shooting a bare bow. I liked it that way. There were only three of us on my campus that even shot a bow. Today, my guess is there would be hundreds at the same school. 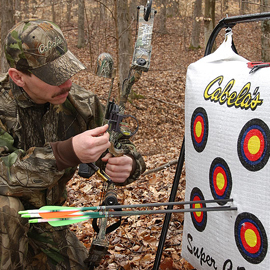 Archery has changed so much and become so popular that archery-deer season is a big deal across the south. You can hardly drive by a house in the rural south without seeing a foam deer target standing in the backyard, which sure beats hay bales and bathroom doors. I miss those days, though. I can remember a popular T-shirt at the time that had a silhouette of an American Indian, sitting horseback, raising his Bear Whitetail Hunter over his head and the words "What If?" emblazoned across the front. Along those lines, I often think about going back with my Matthews MQ1 (which is discontinued by the way) and doing my own "What If?" scenario, without the match sticks of course. Nice to think about, at least until it gets a little cooler.